Description: A pair of SD40-2s have a rack train in tow, as it departs Northtown. Description: The Madison Turn passes the Cotton Belt Freight House at the end of the day. Description: The is one mean looking cloud, but one sweet consist; no widecabs here! Description: Westbound at Talmadge Ave. 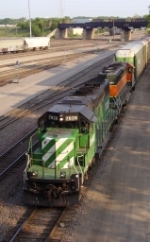 Description: A roster of one of the BN's most valued engine, the SD40-2. Description: BNSF Interbay Diesel Facility.